When comedy collective AIB turned actor Irrfan Khan into a series of memes, they probably didn't realise just how far the memes would travel. The "Dank Irrfan" meme was recently used by Nagpur Police in a well-received online campaign to make the city "child-beggar free." And now, taking a cue from Nagpur Police perhaps, Bengaluru police have used the same AIB meme and upped the social media game with a witty Game of Thrones reference as well. 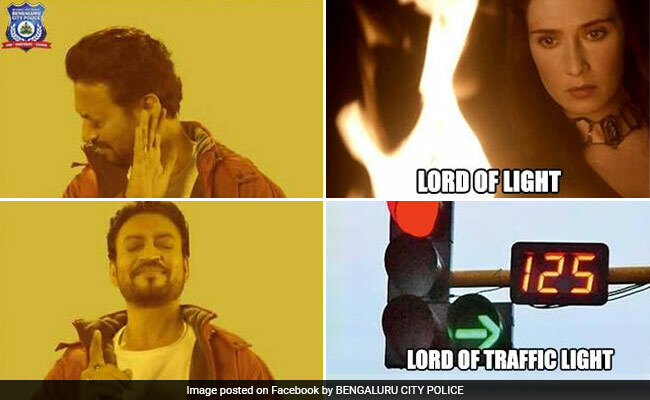 In the meme, a spin on the viral "Drake Approves" meme, Irrfan Khan is seen "not approving" of the Game of Thrones character R'hllor, also known as the Lord of Light and instead giving his "approval" to the "Lord of Traffic Light." In a caption accompanying the meme, Bengaluru City Police writes: "Swear it by the old roads and the new, there is only one lord on the streets of Bengaluru. All hail, Traffic light!" In 24 hours, the tweet has been 'liked' over 1,300 times and retweeted over 500 times. Take a bow, admin. You're awesome! Tips hat to your SM managing intern. I love the way u guys come up with such quirky stuff! Meanwhile, this person couldn't resist using the Game of Thrones reference to point out how insufferable Bengaluru traffic is.